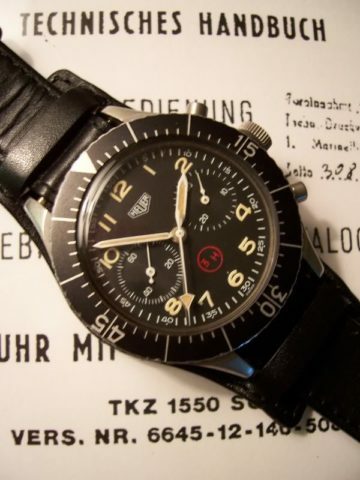 Heuer Bund 1550 Service Manual – I Already Have a Watch. Here’s a copy of the Heuer Bund 1550 Technical Handbook and Service Manual. This was the technical manual from the (West) German Air Force Material Service (Materialamt der Luftwaffe) publication no. GAF T.O. 49B2-1HLB1-1 Technical Handbook and Service Manual, dated 2 May 1972. Operation, Maintenance, Repair, and Illustrated Parts Catalog for Heuer and Sinn model 1550 SG wrist chronograph models made for the West German Bundeswehr from approx. 1967-1981, TKZ 1550 SG, NSN 6645-12-146-5081 for the complete watch and strap set; watch head alone is NSN 6645-12-146-3774.